The holiday season is approaching and you might be looking at your walls and finding holes in them that you want to fix before your guests arrive. In today’s newsletter we are going to discuss how to cover them up before they get there. Please note, these are instructions for minor cracks or holes and are not for major work. For major drywall repairs, there might be a chance that you will need to have the whole drywall redone. Contact us today if you have any questions. Please read all of the information before proceeding to any work. Let’s say you have located a hole in your drywall and you want to patch it up. As starters you will need to purchase drywall compound at your local department store. Remember, if you have any questions you can always inquire the workers at the store if it is suitable for drywall work. Once you have purchased the drywall compound (mud), return to the wall where you have located the hole. Cut out any debris around the hole and make it smooth with a construction-based razor knife. Next, fill the hole with drywall mud with a patty knife and smooth it out some more. Let it dry for about 24 hours and sand it smooth. Apply more layers if needed until the hole is covered and is even with your wall. This might take several times until it is glossed over. If the hole is much larger than a the size of a screw. Then, you will need a patch. They come in various sizes at your local department store. First, makes sure there are no bumps around the larger hole by sanding them off with a sander (you can also purchase this at your local department store). The patch that you have purchased is adhesive and you should be able to peel the back and stick it over the larger hole. Using a patty knife spread the drywall compound over the entire patch. Allow the compound to dry and sand it smooth. Repeat the process until it is flat and aligned with your wall. Make sure you spread the compound and smooth it out a bit beyond the hole. Larger hole than a screw or a hole bigger than the size of a tennis ball will require actual drywall plasterboard work to be done. This is when we would come into play. At this point actual drywall work needs to be executed and it would require you to construct as if you are installing boards. We have discussed how to put up drywall in our previous posts. Today we are just looking into cosmetics and covering smaller holes. We hope that your walls do not have these types of substantial damages but at the same time we understand that these things may happen (pushed in by furniture, etc). If you have discovered a really big hole in your wall, why not let the professionals take over or contacting them for advise? 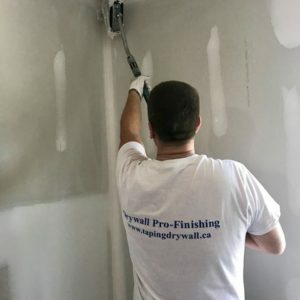 At Drywall-Pro Finishing, we are here for YOU. From new walls to be put up to create a new room to fixing serious damage to your walls, our drywall pros are always prepared to serve you. If you would like to get in touch or if you have any questions, please contact us today to hear about how we can complete your drywall project right away. Stay tuned for more drywall related new, info, and advice from Drywall Pro-Finishing and, as always, stay constructive, our friends! This entry was tagged drywall, repair, toronto. Bookmark the permalink.